I MPACT PLAYER By Ryan Williamson ly-ranked Pioneers, the sophomore forward from Highlands Ranch, Colo., has become one of the top scoring threats on a Denver team that lost a number of key contribu- tors from the 2015-16 squad. After DU got off to an 0-2 start this season, Terry showed his ability to be a difference-maker by going on a four-game point streak to help the Pioneers get on track. "He's become a 200-foot hock- ey player," said head coach Jim Montgomery. PHOTO BY Getty Images AS A KID GROWING UP NEAR DENVER, Troy Terry had a rinkside seat to watch the University of Denver hockey team win back-to- back national championships. His family had season tickets and often made the trip to Magness Arena to watch those dominating Pioneer teams that featured the likes of Paul Stastny, Matt Carle and Gabe Gauthier. Fast forward a decade and now it's Terry's turn to be the player that Colorado kids are looking up to. 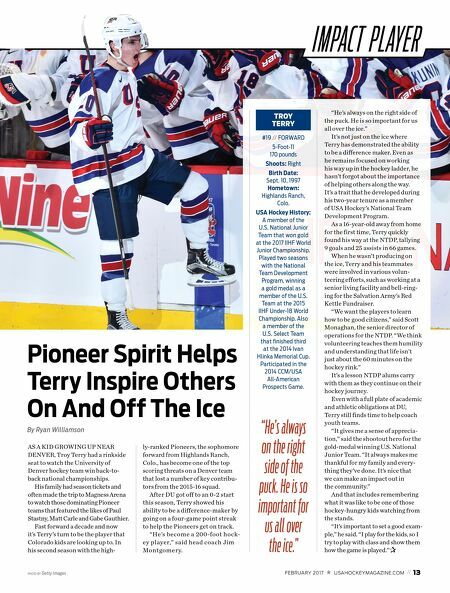 In his second season with the high- FEBRUARY 2017 USAHOCKEYMAGAZINE.COM // 13 Pioneer Spirit Helps Terry Inspire Others On And Off The Ice TROY TERRY "He's always on the right side of the puck. He is so important for us all over the ice." It's not just on the ice where Terry has demonstrated the ability to be a difference maker. Even as he remains focused on working his way up in the hockey ladder, he hasn't forgot about the importance of helping others along the way. It's a trait that he developed during his two-year tenure as a member of USA Hockey's National Team Development Program. As a 16-year-old away from home for the first time, Terry quickly found his way at the NTDP, tallying 9 goals and 25 assists in 66 games. When he wasn't producing on the ice, Terry and his teammates were involved in various volun- teering efforts, such as working at a senior living facility and bell-ring- ing for the Salvation Army's Red Kettle Fundraiser. 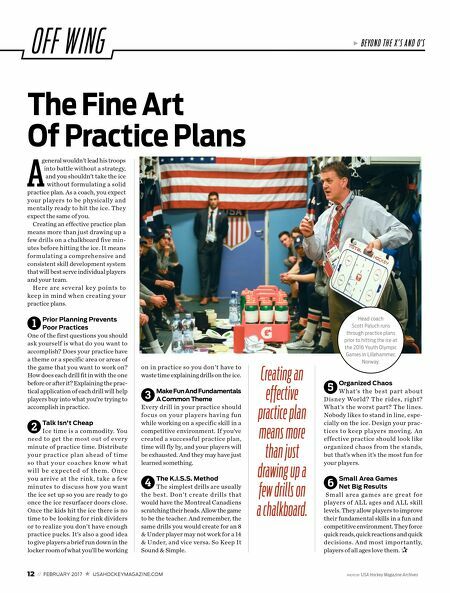 "We want the players to learn how to be good citizens," said Scott Monaghan, the senior director of operations for the NTDP. "We think volunteering teaches them humility and understanding that life isn't just about the 60 minutes on the hockey rink." It's a lesson NTDP alums carry with them as they continue on their hockey journey. Even with a full plate of academic and athletic obligations at DU, Terry still finds time to help coach youth teams. "It gives me a sense of apprecia- tion," said the shootout hero for the gold-medal winning U.S. National Junior Team. "It always makes me thankful for my family and every- thing they've done. It's nice that we can make an impact out in the community." And that includes remembering what it was like to be one of those hockey-hungry kids watching from the stands. "It's important to set a good exam- ple," he said. "I play for the kids, so I try to play with class and show them how the game is played." P #19 // FORWARD 5-Foot-11 170 pounds Shoots: Right Birth Date: Sept. 10, 1997 Hometown: Highlands Ranch, Colo. USA Hockey History: A member of the U.S. National Junior Team that won gold at the 2017 IIHF World Junior Championship. Played two seasons with the National Team Development Program, winning a gold medal as a member of the U.S. Team at the 2015 IIHF Under-18 World Championship. Also a member of the U.S. Select Team that finished third at the 2014 Ivan Hlinka Memorial Cup. Participated in the 2014 CCM/USA All-American Prospects Game. "He's always on the right side of the puck. He is so important for us all over the ice."